We have two spacious rooms beautifully designed capable of accommodating up to 45 persons each. 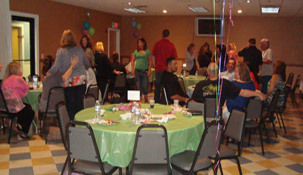 For parties up to 90 people, both rooms may be reserved. We simply open the divider to accommodate all your guests. 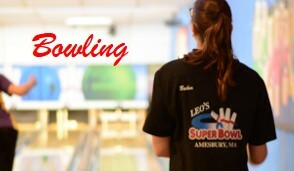 Bowling is not the only attraction here at Leo's Super Bowl. We now feature the Mammoth Arcade Room housing a gigantic 10ft X 12ft projection TV. Totally awesome video machines and interactive experiences such as the "Dance Dance Revolution SuperNova" provide excitement for all ages! Exercise, Socialize and have fun. Mixed, Men, Youth, Senior Leagues. 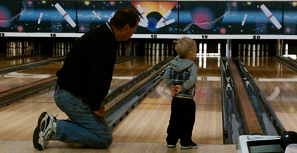 Whether you're a novice or like a little competition, we have a league just for you.